Did you guys make the nursery rhyme? It's awesome and the game seems really fun too. Would definitely try this with my class, problem is ... the parachute. Is there any possible substitute to that? 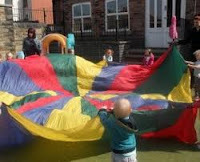 The parachute is perfect as it is colourful and has the handles. You can order it on Amazon. You also can use a round tablecloth, just fix some handles to it. Cut eight pieces of shoelaces. Sew the shoelaces around the tablecloth.